What can we observe with a SHG? 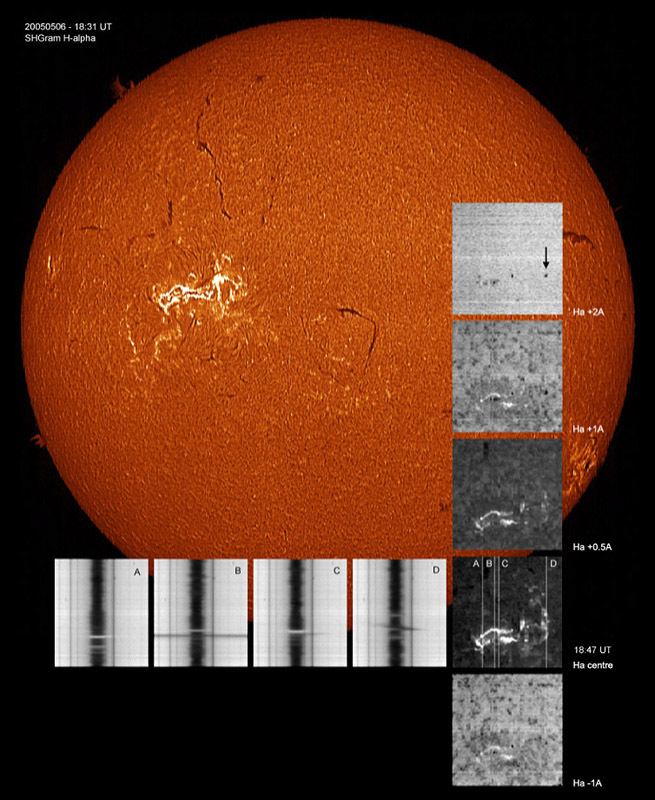 The idea according to which the spectroheliograph allows to form images of the Sun in any wavelength of the visible spectrum is completely correct, but all wavelengths do not present necessarily any interest. There are even few wavelengths which show the Sun under a different aspect from what we see in white light. The continuum is emitted by the photosphere and thus gives images equivalent to the white light. Most of absorption lines are produced very near the photosphere and thus reveal also almost nothing about the structure of the chromosphere. Some lines can however give invaluable information about magnetic fields or motions of matter at low level. The lines formed in the chromosphere are the ones who are going to allow us to investigate this layer of plasma essentially modelled by magnetic fields. The most intense are hydrogen alpha (C) and ionized calcium (H and K). The telluric lines indicate to us obviously anything particular and are even annoying for the observation of the solar spectrum. We can say in first estimate (cf. reminders) that the more we move the sensor closer to the centre of the line and the more we observe high layers of the chromosphere. Conversely, while going towards the extremity of the wings of a line, we join the photospherical level. This is to modulate according to the nature of the observed structures. Density, temperature, speed of gas are not homogeneous in all points and there are intensifications, clarifications or gaps in the spectral line. It is also necessary to take into account the bandwidth of the spectroheliograph which allows to isolate more or less correctly the heart of the spectral lines. The contrast or/and the revealing of the chromospheric structures depend strongly of the bandwidth. Images obtained in this spectral line show the upper chromosphere, where the density of the matter decreases and where the magnetic pressure dominates the pressure of the gas. The plasma is "modelled" by the lines of the magnetic field and reveals the structure. Spicules, prominences and filaments, vortices, etc. are so many chromospheric structures governed by magnetic fields. Near the core of the line (0,03 nm), the image of the Sun presents many details, notably a granulation (4 - 5 ") which structure changes near sunspots by taking the aspect of whirlwinds (Solar vortices). Sunspots are still very visible. It is about the "middle layer" of chromosphere. In the center of the line, we obtain the image of the upper layer of hydrogen, characterized by brilliant areas and dark filaments. Granulation and solar vortices are much less visible in this case. Even the small sunspots seem erased. At the sun limb, prominences are quite visible but the narrow band-width can limit their visibility if they have fast radial motions (important spectral shift). It is with this wavelength that we can better observe the solar flares. We also can, by masking the solar disc, highlight prominences and obtain an image looking like what a small coronagraph (prominence attachment) would give. This line is really very wide and complex, showing a profile in absorption and in emission. It results from various levels of the chromosphère. The emissive part of this line reflects the temperature of the matter and creates brilliant regions, called "plages" or faculae , which we notice particularly around sunspots. We also observe spotless faculae, which can be the place of appearing of new spots, or mark the place of disappeared spots. Other brilliant points mark the outlines of the cells of the supergranulation and form the chromospheric network. The line H (396.85nm), also induced by ionized calcium, gives the same images as her twin sister K.
As for the line of hydrogen, the deviation from the axis gives the image of the low layer (500km), close to the photosphere, with quite visible spots and faculae areas which appear clearly. We speak here about the component K1	of the K line. Near the core of the line (0,02 nm), the chromospheric network appears clearly and facula areas brilliant (own emission) with regard to the rest of the very dark disc. It is the component known as K2. The core of the line (component K3) is characterized by a strong absorption revealing dark filaments and, as in the case of the H alpha line, prominences in emission at the sun limb. In fact, the images obtained with a band-width of 0,05 nm can not give a pure image K3. We rather speak in this case about images K2,3. There is a less good visibility of filaments and prominences. 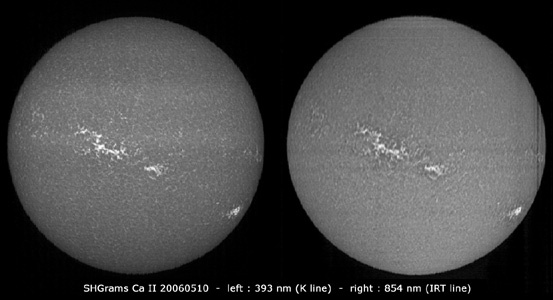 Images obtained in these three lines also show filaments and prominences but with a lower contrast. They also reveal broad dark areas around the active areas and a dark chromospheric network. The contrast of the details decreases much with H-delta because the width of the line is rather narrow. This spectral line is at the origin of the discovery of the element Helium the name of which is diverted from Helios. It is easily visible in emission in the prominences, appears on the disc only in particular conditions. One can locate it in aborption in the dense filaments and in the "plages". It can also appear in emission in the flares when the temperature borders 20000 K and if the density is sufficient. The CCD sensor allows generally to investigate the spectrum a little farther in the red or the purple than allows human eye. There are in the infrared 3 lines of absorption induced by ionized calcium. Here, a comparison between the purple and infrared lines shows that the same chromosphériques structures are visible with a similar aspect. As example, the image below illustrates a part of what is accessible to the spectroheliograph. Taken in the center of Ha, it shows all the variety of the chromosphériques structures, in particular a very large flare. Images taken on both sides of the core of Hα (vertically) or spectres in diverse places of the active region (horizontally) allow to better understand the phenomenon. Also see the page "Sunspots spectra"